Kids are full of potential. And unlocking it starts with a great lunch. Now LUNCHABLES has mandarin oranges for a full serving of real fruit. Really? I think it does get better than this. Also mandarin oranges are going to turn your daughter into president material? An ivy league education, yes. A processed, convenient lunch in a box? Um, sorry. I just don’t buy it! Um, Houston? We got a whopper of a problem. These companies got the money and we got…well…let me think….our brains (and our looks, for those of you who are not anonymous). So, we gotta use ’em! It’s our job to question these subtle messages in the ads we see. We can’t just let them slide by and go on with our day. 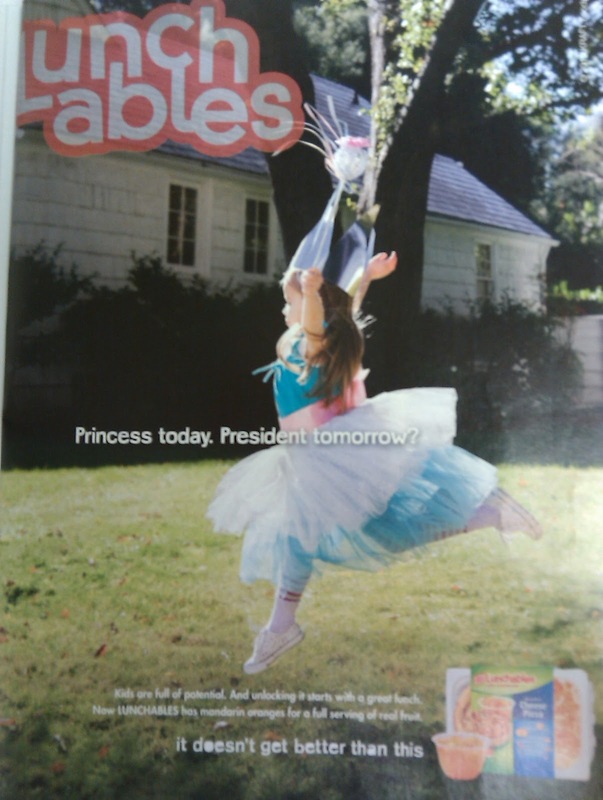 When I saw this print ad, I thought about how we discussed Lunchables already, via guest blogger and last summer when I critiqued another similar ad and then went to the store and took pictures of the nutritional information and ingredients. The ad above must be from that same family of ads. But I couldn’t resist bringing it to your attention. I’m not a fan of Lunchables (I can’t imagine that shocks anyone), but I did want to eat them when I was younger. We rarely got them; maybe once a year or less. Back then, it was just crackers, cheese and little circles of ham. My mom didn’t buy them because it was cheaper to just buy those ingredients and assemble them at home. A pizza lunchable wasn’t available then. They look so unappetizing to me! Here are the ingredients and nutritional information for a Lunchable similar to the one in the ad (~600 odd grams of sodium, ~70 grams of carbohydrates, including 35 grams sugar). Previous PostYou’ve got mail!Next PostHow you doin’? Blech. That's all I've got. Blech on the ad, blech on the packaging and ingredient wasteland that are Lunchables, blech on the (wow!) sugared fruit when it takes 1 minute to peel an orange. Blech, blech, blech. i'm still as appalled now as i was when i wrote the guest post that this is passed off as nutrition. it's not. it's chemicals shaped like food wrapped in a bright yellow box. you know the movie "crazy people"? how it had the truth in advertising campaign? i think that lunchables needs that. I'm grateful my kids have no interest them or that would be a battle and a half. I shutter to think how many parents use these ads to justify buying this product for their kids. I don't see how this could be satisfying or filling either. If I decided to feed my children over proceeded junk, lunchables would not be my first choice! I remember the first time that you logged about lunchables. Many of your readers felt that the ad critique was off topic and that parents needed to take more responibility for what they were feeding their children. I think you will likely get a similar response this time. I'll agree with you, the ad is kinda dumb. The food is way overprocessed and it low enough quality that I wouldn't serve it to my kids. I'd rather buy them lunch meat directly from a deli counter. I don't buy that this product will do anything that it claims it will, but because the ad is not making scientific or health claims I believe it is perfectly legal. One of the biggest fights I see brewing in this conversation (not just your blog but across the internet) is the role of personal responsibility. It is up to parents to decide what to feed their children. Kids can't work an so technically any money they have came from their parents or extended family. That's what makes the area of personal responsibility so sticky. Kids can't take personal responsibility for themselves. And in terms of making proper decisions, it has been shown that the area of the brain that monitors long term consequences of decisions made (the frontal lobe) does not develop until a person is in their early twenties. This presents a whole host of issues when we start talking about marketing to kids. Because the scientific community has proven that most kids biologically can't make decisions based upon long term implications of their actions, such as healthy eating for a healthy body. I do believe in personal responsibility. But I also believe that heavy marketing to both children and adults has changed the food culture of our society. Even the most educated and discriminating of us fall prey to marketing when it sounds like what we already believe. In a culture that believes 'an apple a day keeps the doctor away' a product like apple juice would never be a proper substitue for a whole apple. But thanks to USDA food pyramid guidelines, many parents think that drinking apple juice is just as healthy as eating an apple. BECAUSE ACCORDING TO THE GOVERNMENT IT COUNTS AS A SERVING OF FRUITS OR VEGETABLES. This is perposterous to me and countless others. We must work to change our food culture, or the marketers will do it for us. Awful. It plays in to parent's fears that they are not doing enough for their children to succeed because they are too busy, too harried or just don't know how to feed their kid a healthy lunch. My daughter was heartbroken I won't buy them for her until I calmly explained that 1) there's milk in it (she's intolerant) and 2) she doesn't eat anything Mommy can't pronounce and there's not a lot of that in the world. Plus, Mommy reads. I'm proud to say my girl is becoming more conscious of what it means to eat healthy because my husband and I weren't afraid to feed her whole foods when people told us she wouldn't fit in at school. I'm serious. It's a sad state of affairs (that angers me) when companies manipulate parent's fears to get them to eat something that is not food. It may have been food 27 steps ago but it isn't now. I ate Lunchables when I was a kid. Looking back now I don't know how I could endure it. The meat and cheese was so rubbery. The Pizza kinds did exist for me and they were oddly bland. Yet I still ate away. We have made so many good choices with our kids as far as the types of food we introduce them to. My 2 year old might love salads and Indian food but you put a bag of chips or fries near her and nothing else exists in the world. The inundation of unhealthy foods in the market remains prevalent and our responsibility to our children is to ensure good eating habits still prevail. Talking about marketing unhealthy foods to children and things like Lunchables is spot on with the goal of your blog and I agree with you one the subject wholeheartedly. I am equally concerned about how the government pares back nutrition requirements for children to the bare minimum and allows food companies and marketers to claim their products are healthy when clearly they are not. I am disappointed to see this ad is using health and nutrition as a means to justify convenience food purchases made by busy parents. It is almost like the ad is saying, "Don't worry Mom/Dad, you can cut all the corners you want and she'll be totally fine..better than you thought actually….in the long run." As parents we must stop cutting corners, dig our heels in and stand our ground to make sure we teach our kids about the dangers of marketing. I started in the cereal aisle with my kids and I am grateful they are even partly aware of the pitfalls found in grocery stores. It makes purchasing for them much easier. Many of your readers felt that the ad critique was off topic and that parents needed to take more responsibility for what they were feeding their children. That's because they want to think there are no outside influences on their decision making. Companies aren't spending billions of dollars every year in advertising so you can "take more responsibility". They're doing it so you will buy their product – and they use every trick they can to convince you. The more they repeat their message, the more they get people to believe it. Wow, I hate how there is a paragraph of ingredients on the back of the boxes. !!!! I remember begging my mom to buy them for us. I'm so happy we very very rarely ever got them. I don't know what the appeal was? The packaging, the bright colors, the fact that you could put together your own mix and match of lunch meat, cheese and crackers? Or maybe just because we weren't allowed them was what made them so appealing? I stand with you and say…there are better options. I live in an area where we always have fresh veggies and seasonal fruits. I also know that it is not the case in most of America, especially in the winter. Since viewing "Food Revolution" last year, I am making the choice to serve my children homemade (from scratch) or fresh foods. It's not easy as picking up a processed package lunch ( like the above named) but, I feel better knowing they are getting a good meal. I NEVER ate Lunchables, not because my mom wouldn't buy them, but because I thought they were gross. AND I was a very picky eater…hardly ate healthy…just junk food and potatoes in every form. Not only did I not like the crackers, cheese & meat combo, I didn't like the pizza ones that my classmates LOVED. The "crust" was tasteless and cardboardy, and I hated the sauce. We ate Lunchables a lot as a kid. I love how a few other people said they know better now. It's not good food. It doesn't taste good and it never did, but as children it was appealing for some reason. The high and mighty mother in me says that parents "should" know better. But truly, I know now that my mom didn't know better. She really thought that was a good alternative when we were pressed for time or just a nice little treat. We have to keep learning. And we have to keep educating everyone, kids and parents alike. INGREDIENTS: WATER – SPRING WATER. APPLESAUCE – APPLES, WATER, CONCENTRATED APPLE JUICE, ASCORBIC ACID (VITAMIN C). SUB BUN – ENRICHED BLEACHED WHEAT FLOUR ([WHEAT FLOUR, NIACIN, REDUCED IRON, THIAMIN MONONITRATE VITAMIN B1, RIBOFLAVIN VITAMIN B2, FOLIC ACID], MALTED BARLEY FLOUR), WATER, WHOLE WHEAT FLOUR, SUGAR, CONTAINS 2% OR LESS OF THE FOLLOWING: SOYBEAN OIL, YEAST, DOUGH CONDITIONERS (MONO & DIGLYCERIDES, SODIUM STEAROYL LACTYLATE, ENZYME MODIFIED SOY LECITHIN, DATEM), SALT, GUAR GUM, MODIFIED CELLULOSE, CALCIUM PROPIONATE PRESERVATIVE), XANTHAN GUM, ARTIFICIAL FLAVORS, ENZYMES. CONTAINS: WHEAT, SOY. OVEN ROASTED TURKEY BREAST – CURED – SMOKE FLAVOR ADDED – BROWNED WITH CARAMEL COLOR – TURKEY BREAST, WATER, POTASSIUM LACTATE, MODIFIED CORN STARCH, CONTAINS LESS THAN 2% OF SALT, DEXTROSE, CARRAGEENAN, SODIUM PHOSPHATES, SODIUM DIACETATE, SODIUM ASCORBATE, SODIUM NITRITE, NATURAL AND ARTIFICIAL FLAVOR, SMOKE FLAVOR, CARAMEL COLOR. REDUCED FAT CHEDDAR PASTEURIZED PREPARED CHEESE PRODUCT – PASTEURIZED PART-SKIM MILK, WATER, MILKFAT, SODIUM CITRATE, CONTAINS LESS THAN 2% OF MILK PROTEIN CONCENTRATE, WHEY PROTEIN CONCENTRATE, LACTIC ACID, SORBIC ACID AS A PRESERVATIVE, SALT, OLEORESIN PAPRIKA (COLOR), ANNATTO (COLOR), VITAMIN A PALMITATE, ENZYMES, CHEESE CULTURE, WITH STARCH ADDED FOR SLICE SEPARATION. CONTAINS: MILK. NILLA WAFERS – UNBLEACHED ENRICHED FLOUR (WHEAT FLOUR, NIACIN, REDUCED IRON, THIAMINE MONONITRATE [VITAMIN B1], RIBOFLAVIN [VITAMIN B2], FOLIC ACID), SUGAR, SOYBEAN OIL, HIGH FRUCTOSE CORN SYRUP, PARTIALLY HYDROGENATED COTTONSEED OIL, WHEY (FROM MILK), EGGS, NATURAL AND ARTIFICIAL FLAVOR, SALT, LEAVENING (BAKING SODA AND/OR CALCIUM PHOSPHATE), MONO- AND DIGLYCERIDES (EMULSIFIER). CONTAINS: WHEAT, MILK, EGG. NONFAT MAYONNAISE DRESSING – WATER, VINEGAR, MODIFIED CORNSTARCH, SUGAR, HIGH FRUCTOSE CORN SYRUP, SOYBEAN OIL*, CONTAINS LESS THAN 2% OF SALT, NATURAL FLAVOR, CELLULOSE GEL, ARTIFICIAL COLOR, XANTHAN GUM, EGG YOLKS*, MUSTARD FLOUR, LACTIC ACID, PHOSPHORIC ACID, CELLULOSE GUM, VITAMIN E ACETATE, LEMON JUICE CONCENTRATE, DRIED GARLIC, DRIED ONIONS, SPICE, YELLOW 6, BETA CAROTENE (COLOR), BLUE 1, WITH POTASSIUM SORBATE AND CALCIUM DISODIUM EDTA AS PRESERVATIVES. *TRIVIAL SOURCE OF FAT AND CHOLESTEROL. CONTAINS: EGG. TROPICAL PUNCH ARTIFICIAL FLAVORED SOFT DRINK MIX – SUGAR, FRUCTOSE, CITRIC ACID (PROVIDES TARTNESS), CONTAINS LESS THAN 2% OF NATURAL AND ARTIFICIAL FLAVOR, ASCORBIC ACID (VITAMIN C), VITAMIN E ACETATE, CALCIUM PHOSPHATE (PREVENTS CAKING), ACESULFAME POTASSIUM AND SUCRALOSE (SWEETENERS), ARTIFICIAL COLOR, RED 40, BLUE 1, BHA (PRESERVES FRESHNESS). That's from the Lunchable Mom wholsome food site, today. Not food, but a veritable chemical soup. I must be a lot older than most of you, because lunchables came out when I was almost done with high school. Unfortunately, this just represents an egregious combination of what's found in all supermarkets. Putting together your own lunch from similar ingredients may be cheaper, but not healthier. I don't buy them but I do assemble home made lunchables on occasion. The kids get more food, more fruit, better lunch meat that way. The oldest commented that her friend had a lunchable and it had a piece of candy in it. The kids aren't supposed to have candy at lunch but no one said anything. My son, who has never eaten one, asks me to buy Lunchables, all because of the power of advertising. I say no every single time. When he asks me why I pick one up and show him why. I do not feed him chemicals and frankenfood. And since I'm the only one doing the grocery shopping I am the first, last and only line of defense for his health. I dont' care if they tell me that eating Lunchables will help my son grow up and solve all the world's problems, I'm still not feeding him that garbage. As for Lunchables, I think I was out of school before they came out, at least in our area. I always wanted to try one (I had a major love affair with TV dinners), but couldn't bring myself to pay the exorbitant price for something that would only be a snack. Later on, I decided to just do it, and went to pick on out… only to find that none of them looked good! Now I know better, and they're even more unappealing, but I can still see the draw for kids, if not for parents. Beyond all the great points that have been presented, I would like to say that a lunchable, would NEVER fill up my children (13, 10, and 7). Even if they were satiated fro the moment, all of that processed garbage with no fiber would never keep tham full for long. Its a big box with hardly anything in it. Ugh. I, too, have problems with how we market to children and teens. I am a Family & Consumer Sciences (that's Home Ec with a makeover!) teacher in a Jr./Sr. High School (7-12) and while teaching about nutrition I also teach about how things are marketed. In our school the kids have access to 2 beverage vending machines, both owned by Snapple. One dispenses water but advertises Snapple Ice Tea on both sides, one side that faces into the cafeteria & one side that faces into the main commons entry where every student passes several times a day. My students and I have talked about the subliminal marketing that is happening with the vending machine. Though they can not buy the ice tea at school, seeing that brand name multiple times a day does increase the chance they will choose that brand when they make purchases. The second beverage vending machine sells Snapple 100% Juiced. Yes, Juiced. With an -ed. I've read the ingredients. There is no added sugars HOWEVER there still is 40 grams of sugar in one 11.5 oz can. One 11.5 oz can of Pepsi contains 40.25 grams of sugar. Students very often drink the Juiced (often on top of a 23 grams of sugar carton of chocolate milk) and then go to class and struggle to focus & learn! Gee, I wonder why! When I teach about marketing the first thing I ask the kids is what the two vending machines say. Just about all of them say "100% Juice" – I then correct them (by showing an empty can) and we talk about how the brain doesn't register the -ed in juiced. The brain "sees" 100% and expects it to say "juice". Is it 100% juice? Yes. Is it really healthy? I say no… not when they are consuming so much of it through the day and in conjunction with so many other high sugar foods. At least when I'm done teaching they are reading labels more carefully. One battle at a time! money they have came from their parents or extended family." Yes, younger kids can't work. Older kids can, and do, work. Ask anyone working in marketing and you will be told kids have the greatest buying power of any group. Kids either convince parents to buy things (in a wide variety of ways) or they spend their own money – given to them or earned – on things they want. Kids money is pretty much all disposable income so it IS important we look at what is being marketed to kids! You know, I disagree. I think that kids degrees of personal responsibility grows and changes as they grow, however it is OUR JOBS AS PARENTS AND TEACHERS to help them learn how to take personal responsibility. Part of doing so is teaching them about marketing methods and about how to make better decisions. This is not the parents' job alone and it is certainly not the teachers' job alone. It takes a village to produce a healthy, happy, capable citizen of the world and it starts at birth. Kids can & do take personal responsibility… it is just a matter of guiding & teaching them to do so. I am looking forward to more about marketing… keep up the great work and the scrutiny on our food! My son is always wanting to get these (he's 4 1/2) but mostly just because it usually has a sweet treat (ie. candy) inside! LOL! Thankfully, we NEVER buy them for him becasue I just can't justify not only the cost, but the absolute riduculous list of ingredients! i mean, should it just say "turkey, orange, crackers, ect"? LOL! Thought I'd play the devil's advocate. As a kid growing up in the 90's it was always really exciting to go on a field trip because those were the only times of the year my mom would actually buy them for my brother and me. The excitement wasn't just due to the fact that i would be eating a treat I was rarely allowed but also because they tasted good. I've always liked the pizza Lunchables. Did my mom screw me over by allowing me the occasional indulgence? No. I grew up to be a healthy, active young woman. I played boys' lacrosse and women's volleyball and now I rock climb and participate in yoga and spin classes for recreation. I eat well and about once a year, I eat a lunchable just for the heck of it. It tastes a little like childhood now. I find it a little ridiculous when parents shelter their kids from as much processed food as they can. They aren't foods one should eat on a weekly or even monthly basis but why can't a little moderation come into play? There is a time for delivery pizza and a time for homemade bouillabaisse and pork stew and all those other wonderful dishes my mom used to make for us. I love seeing a focus on marketing –everything is marketed to us these days, and unless you're lucky enough to be exposed to a class like the one that Chasingdawn teaches, you might remain totally oblivious to it. I think that all high school students should be required to take a class that exposes them to marketing techniques and makes them calculate how much extra they'll pay for something if they charge it and pay the minimum each month to pay it off. Learning about those two things could make for a much smarter group of high school graduates. I have eaten only one Lunchables in my life, when I was 9 years old, and it made me violently ill for 2 weeks after. I suppose if I were to ever become POTUS, I'd ban them, so no little kid would ever go through 2 straight weeks of misery and not being able to eat. Guess I'd better keep my day job. Isn't it up to the parents to decide if their kids eat crap or not, whether or not it is bad for their kids? When my son was 6 he'd bug me to get him Lunchables that had a picture of, I don't know, the Jonas Brothers or something on it. Since he hates cheese and is indifferent to ham, I told him that the food company that makes Lunchables was using the Jonas Brothers to make him want to buy something that he doesn't even really like. I said, "If Lunchables were delicious, would they need to put a picture of celebrities or cartoon characters on it?" He acknowledged that Lunchables' contents held pretty much no appeal, but admitted that the Jonas Brothers' picture on the box STILL made him want to buy it. Awww. We didn't, and he was OK with that, because he felt the Lunchables company wasn't playing fair, with their use of ultra-persuasive images and all. Mm-hm, knowledge is power, little man. He's pretty advertising savvy these days. This article in our local paper talked about how professional chefs feed their kids. They want them to eat a varied diet and be adventurous eaters. But even for them the kids just whine for a luncheable. Also wanted to add, after reading other comments, I agree greatly with advertisers not wanting ANYone to take responsibility. They just want to make money, not help people. Think about Yoplait giving to Breast Cancer research with sending in cup tops. They probably spent more in advertising their donation than they actually donated. Also, there is a lot of evidence that dairy protein feeds cancer cells. The dairy foundation would never want this to be advertised to the public the way they advertise that "Milk Does a Body Good." Also, in Europe they have similar products without as much crap because they don't want it for their kids! Kraft Macaroni n Cheese in boxed form does NOT have artificial dyes in England, but it does in the US because it's cheaper and we don't do anything about it for the sake of "Freedom." Well, I want freedom from artificial ingredients of every kind and I want freedom from chemicals in personal care products. I want the freedom to give my kids a convenient and "fun" food item. Instead I have to say no, it's full of preservatives and artificial ingredients AND sodium. Oh, can't limit that in the US either. That wouldn't be right. Guess what? It's become more important to have the right to clean air than to have the right to smoke. It wasn't always that way. In MD all bars and restaurants are smoke free! It's great! I think we'll get there with freedom to have healthy foods for all, of all ages. Think about how cigarettes were blatantly marketed to kids so that they'd be brainwashed to buy a certain brand by the time they were teenagers or young adults. Now that's a no-no. We'll get there with advertising unhealthy, disease causing foods to children. Also, in response to "devils advocates" who say that children should have crap in moderation. I agree, but make it as healthy as possible. Make it real. Allow children to have cookies made with sugar, but use whole wheat flour and flaxseed and replace oil with applesauce or even replace sugar with honey or agave. If children are fed REAL whole foods and not artificial crap, then their taste preference will be for real foods. Fake food will not be as appealing to them when they are making their own decisions. As one commenter said as she got older, Luncheables, which she'd always wanted but never got, were visually unappealing. Regarding parental responsibility, I agree that parents need to take responsibility for what their children eat as well as their child's whole life. If I want to buy my son a lunchable, I can do that. The problem is the mega-billion dollar, misleading ad campaigns. I mean, the ad above is ridiculous, and it's the tip of the iceberg. Truth is, most moms and dads don't have the ability to distinguish between advertising and reality. Companies are spending $100 million dollars every four days across all forms of media to make sure that line is blurred. My little blog and my opinion are whispers in a hurricane, but at least I'm not quiet. Also at this same middle school-age, one of my friends, quite literally, brought a lunchable to school every single day. At the time, I was always a little envious. I'd have my go-to peanut butter sandwich, and they'd have things like nachos, and crackers, and the pizza thing, with CANDY BARS… Like I said, it was hard not to be jealous at the time. Now as an adult, looking back, I wonder what their home life was like. To have parents who threw a box of processed lunchables at them EVERY SINGLE DAY for three years… that the only variety they ever got was nachos, crackers, or pizza… It just makes me wonder what kind of things they had for dinner, if that was how much attention they put into lunch. Finally (last thing and I'll shut up), for me as a kid, I always thought of mandarin oranges as a guilty junk-food pleasure. My mom rarely bought them because they came in such tiny cans, but I would sneak the cans of oranges like cookies out of a cookie jar–opening the can and drinking the juice like it was soda, eating the oranges like they were my favorite kind of candy… It's just crazy to think that the same fruit I used to "sneak" and feel deliciously naughty about eating, is passed off as healthy in things like Lunchables. I'm 19 and I still occasionally crave a Lunchable. Of course my common sense quivers at that thought of eating that nonsense, but for me it's a comfort to eat food that reminds me of my childhood and for a 90s kid the Lunchable was the quintessential lunch item. If you had one, you were the cool kid plain and simple. I knew they were pretty icky and I usually did end up getting sick from them but when my single mom had to pack a lunch for me for a field trip (only time I ever ate them) it was just the easiest thing to do. My mom stopped packing my lunches when I was in 1st grade because life got too hectic so I went to buying lunch. For me, Lunchables were a saving grace to eat. That being said, I completely agree with everything you have said. One of my pet areas of interest is analyzing the media and advertising. I love picking out spins and misrepresentations. (I'm a weird 19 year old, I know.) It's both interesting and disheartening to see how badly the media manipulate consumers to try and convince them to buy their products. The sad fact is though, that this will never ever change until the government pushes something through that forces food companies to advertise the truth about their products, like tobacco and alcohol ads that need to list the warnings of using such products. But people don't think processed food is nearly as dangerous as alcohol and tobacco so I doubt that something like that will exist for a long while. Until then, whenever I see ads that compare a processed food item like a Lunchable with a more natural and healthy option, like fresh cheese and deli meat rather than the processed stuff, I think it's the best we can get for now. Those comparison ads get people to stop and think which is a step in the right direction. Now that is an interesting comment. Why are other parent's food choices ridiculous? We make a version of lunchables at home – meat rollups. A slice of (real) cheese, a slice of lunchmeat, roll it up like a flute. Crackers are another thing hard to come by – my son has LD and we don't eat BHT or TBHQ which are in so many kinds. So he usually eats European style crackers or Wasa instead of Ritz or Triscuit (which he can't have). My choices may not be other people's choices, but I don't see why that's ridiculous. "My little blog and my opinion are whispers in a hurricane, but at least I'm not quiet." Lunchables should be against the law! That's all I'm gonna say! Lunchables never really held too much appeal for me as a kid – I wanted them, even asked for them a few times, but because they were 'cool', and because they looked like fun. I think more often I asked my mom to make me a homemade lunchable – I didn't actually like half the stuff that came in the real lunchables. as for the ads, I can't fathom how anyone could be swayed by an ad like that. it's just so absurd – there are plenty of things that contribute to what you grow up to be. The brands you buy aren't one of them. When I was in 4th grade, my math teacher got a class subscription to Zillions magazine. It was put out in the 90's by Consumer Reports, and was basically a consumer reports for kids. It had reviews of kid-oriented products (foods and toys, mostly) and a lot of articles about advertising. I ended up getting my own subscription to it for several years after using it in class. One of the articles that I still recall vividly was one that showed how food ads are made: in many cases, it's not required to picture the actual food being advertised. They showed all the weird things advertisers used to sculpt a better-than-real-life picture (and then photos of the actual products for comparison). It's a shame the magazine and website have both been shut down – I think one of the best things we can do to keep kids from getting sucked in by ads is to teach them exactly how they're getting sucked in. And it works for parents, too. If you see an ad and your first thought is, "what's the gimmick here? how are they trying to sell this to me? how can i find out if that claim is true?" it will be a lot harder to get swindled. I don't think anybody said it isn't. We're talking about the disgusting and deceptive advertising, not about the right to feed your child crap. With that said, though, you have to be careful with how far you go with those statements. Is it the parent's right to feed their child nothing but candy bars, three meals of candy a day? Is it the parent's right to feed their child peanut butter sandwiches when they know their child is allergic to peanuts? Is it the parent's right to feed their child lots of gluten when that child has Crohn's and the gluten is literally killing them (albeit slowly)? Is it the parent's right to let their child have a few sips of wine at dinner? Several sips? Get stinking drunk every night? At some point there *is* a line to be drawn. That line is probably not at "occasional Lunchable as a treat", but it's *somewhere*. Parents don't actually have the right to harm their kids. *eye roll* Let's ban everything for our children because a group of suburban soccer moms think it's so bad! You schmucks are raising a generation of entitled, snotty, spoiled children who lack common sense, critical thinking skills and reasoning skills. Thanks to you helicopter broads, this next generation will be useless because they've been so coddled and spoiled. Yes, a generation of people who grew up learning to read the label and see through slick graphic advertising are CERTAINLY the ones who don't have critical thinking or reasoning skills. And the people that see "all natural" on Pepsi and figure it's healthy are… nevermind. Oh, I don't know. First step on my list after I become Dictator of the World (I can have dreams, you know!) is banning suburbs. You schmucks are raising a generation of entitled, snotty, spoiled children…. Spoiled by what? Not getting junk food every time they ask for it? I always thought being spoiled, as a child, involved getting whatever you want, even if it's not good for you. …who lack common sense, critical thinking skills and reasoning skills. The ability to read packaging labels and to recognize when advertising is deceptive can hardly be said to be possessed by people who lack those attributes. Thanks to you helicopter broads, this next generation will be useless because they've been so coddled and spoiled. So you think that food coloring is necessary to be less useless? Now when they want something to eat they are empowered to make good decisions. As Middle School students they are thrilled with the options they have for school lunch. Salad, grilled chicken (which my daughter combines to make a healthy lunch), nice soups and other highly edible, less processed items. Our old school served raw Pop Tarts and Gatorade – this was special for the 7th & 8th graders only. Yuch! I also taught my kids to be nice to people who aren't as smart as they are. So, have a nice day … I'm sure you're a wonderful person!